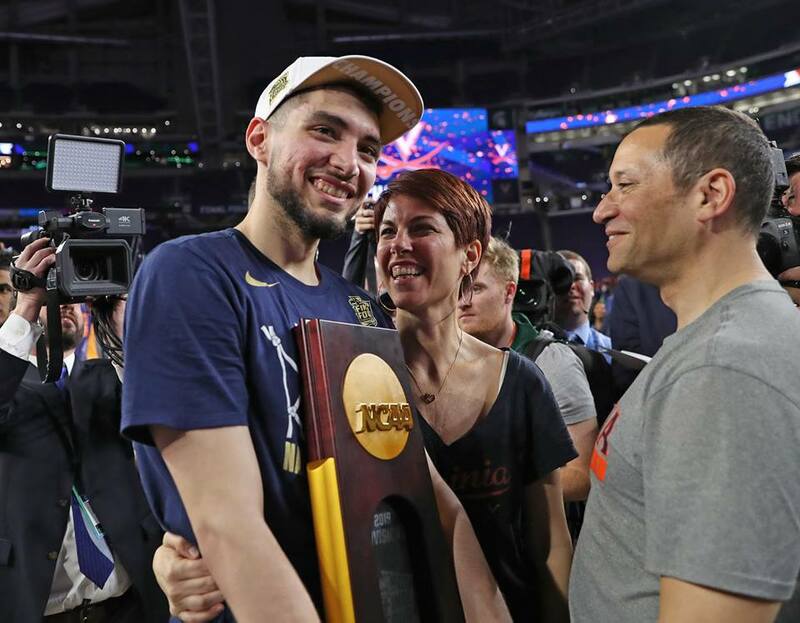 MINNEAPOLIS – As the on-court celebration slowly wound down at U.S. Bank Stadium on Monday, Ty Jerome made his way down the steps of the temporary stage at midcourt with the National Championship trophy in his hands. Confetti covered the playing surface and Virginia family and fans surrounded the area. Jerome walked straight to his family, looked at his father Marc without saying much, and then just dropped his head on his shoulder. A firm, emotional, family bear hug followed as Jerome let the emotions flow. The Virginia Cavaliers had just become National Champions for the first time in school history and the journey to get there had been exhausting. After the previous year’s NCAA Tournament came to an abrupt end at the hands of Cinderella UMBC, just a week after the Hoos stood on the ACC Tournament stage as champs in Brooklyn, UVA’s players had to cope with what happened. For Jerome and Kyle Guy, they also had to handle the press conference media duties alongside coach Tony Bennett where the questions to somehow frame their emotions were tough to process. By the time, the New York guard got back to his parents at the hotel, he just let it all pour at in his family’s embrace. From there, the opinions of the program and its short-comings in March swirled about and social media, of course, made Virginia the target of ongoing jokes. Then the workouts. The long, grueling, sometimes self-guided multiple times a day workouts followed. And, finally, a season bent toward a better ending brought the Hoos to the Final Four in Minnesota where two dramatic games with Auburn and Texas Tech left UVA as the National Champions. So when Jerome walked down those steps, he needed that embrace again. It had been a long time coming. Jerome played a mighty, mighty role in creating that moment in Minneapolis. Over two games, he produced 37 points, 15 rebounds, and 14 assists with only 3 turnovers. Per SportsReference.com, he’s the first player with that lofty of a Final Four stat line – 35, 15, and 10 or more across the board – since Derrick Rose in 2008. The junior guard surpassed 1,000 career points in the win (1,011) and moved into a tie with Sean Singletary for third on the single-season list for assists with 202. Jerome made the all-tournament team along with Kyle Guy and De’Andre Hunter. In the National Championship game, Jerome’s virtuoso playmaking was akin to an artist painting a picture. A heavy brush here, a deft touch there. A bold stroke next. And the finishing touches that lifted the final product to museum levels. He repeatedly pulled his dribble to the left, to the right, back, and around to manipulate defenders and touch the lane. And when the Red Raiders swarmed as they’ve done so well all season, he’d whip another shot-finding pass away from the danger and into someone’s ready hands. Never was that more true than in the final 20 seconds of regulation with the Hoos facing a 68-65 deficit, the season and storybook ending on the line once again. Within the set the team called, Jerome sliced into the paint and waited until the precise moment that Texas Tech’s instincts kicked in to find him to guide a pass out to De’Andre Hunter just in front of the Cavalier bench. Hunter rose, released, and rained in a 3-pointer to tie the game and the it’s-never-over Wahoos were alive again. Freshman teammate Kihei Clark watched it all with true appreciation. Those plays all weekend long, from providing the punch needed early against Auburn with 13 of the team’s 28 first-half points to the passes that ripped out the hearts of Texas Tech, Jerome helped his team write an ending worthy of the long journey to get there. The team that created awe-inducing moments in the NCAA Tournament secured the gold at the end of the rainbow that followed the storm of a March gone by. They became Wahoo legends in the process and stood together to watch the signature ending to the madness. Unlike the year before, this was not a painful exercise. Just joy. Thanks, Kris. Wonderful article. Go Hoos. Radio guy went through the list of people who had done the 35/15/10 in a final four before. Was about 10 folks most of whom are NBA hall of famers with a couple of exceptions. Bird did it and the Big O twice. Walton too I think. . I rewatched the game – again – last night. The whole team played so well, the best I’ve ever seen them play. Every guy was so good. Especially the overtime. Watch that again yourself and you’ll see. Amazing.